Characters narrating what just happened or what they're doing, it's insulting to the audience. The film really feels like a recap of the whole Book One of the animated searies, relying on narration to fill in the gaps and provide continuity. Stiff, dictated, and just really bad acting, it's really frustrating. With some background in theater, I'm tempted to rant on to a lecture here but it's pointless. I know Noah Ringer (Aang) has no acting background and was cast only for his appearance and his martial arts skills, but how come the other actors fell short of par expectations? Blurred and sort-of-3D-without-glasses (but we watched it in 2D) panning shots and weird choice of focus points, it tried─and almost succeded─in giving me a headache. Even basic been-done-before shots are executed sloppily; my untrained eye detected it effortlessly. Really bad script, I found myself editing the characters' dialogue. Okay, this one I kind of do for a living and it just came automatic: Do you put things "at" or "on" the table? You "exterminate" pests and you "execute" people. Good but really-could-be-more-awesome bending effects. I think this one they almost got spot on (if you don't compare it to the animated version). I was left wanting. A really great story butchered. If you get past all of the above, it's a really good narrative, something with a mix of ancient magic and spirits (insert bias to anything supernatural here). It should make you want to see the series. Please, please feel free to do so. ...so that's what you missed on The Last Airbender." I heard all the casting hulabaloo this movie generated and I thought: Hollywood has done it before, maybe it would be unnoticeable. But it feels kind of weird when almost everyone except the main cast are of Asian descent. I was only able to watch more than a few episodes of the animated series. The movie opted to stray away from the things that made the series a striking hit (remember the comedy, the action, the heart that can win wars?). Marathon-ing the series again is a must-do to erase the horrible adaptation that the movie is. I just really hope someone shakes-to-the-core (or bangs their heads to a concrete wall, whatever you choose) the writer, director, producer, and/or the studio to demand much more in the next two books of the series, if and when they still decide to make them. The Last Airbender gets four out of ten, for good material turned bad. It's a crying, crying shame. This will not be a review of The Last Airbender. Well, maybe just a pseudo-review. If there even is such a word. A lot of critics hated the film. I, however, love Shyamalan, and so was willing to make him explain his atrocities in an interview on Google Wave, before it decided to shut down. DA COUCH TOMATO: Let's start from the beginning. I mean, the very first shots of the film. Isn't that a rip-off of the opening sequence for the animated series? M. NIGHT SHYAMALAN: Well, yes, but it's live action. DCT: Duh. We all know that. Anyway, what happened, Mr. Shyamalan? I used to like you as a director. I mean, you're an auteur, and one of the best in Hollywood, I must say. SHYAMALAN: Thank you. I hope you don't like me in a homosexual way, though. And yes, I consider myself an auteur, which is why I had trouble with adaptation. As you can see in the end credits, it says, "Written, Produced, and Directed by" me. DCT: Yes, I noticed that. Trying to do all the work, eh? Does that mean you'll get paid three times as much? SHYAMALAN: No, it means Paramount and Nickelodeon will save three times as much. DCT: So what exactly about adaptation are you having trouble with? I mean, Lord of the Rings was thought to be an un-filmable film (what? ), and Peter Jackson was able to pull it off. SHYAMALAN: Well that's the thing. Peter Jackson had two other people with him to adapt the screenplay, and that was Fran Marsh and Philippa Boyens. I, however, did Airbender all on my own. So it goes to show that in adaptations, too many cooks do not spoil the broth. DCT: So you do admit that the failure in this film is your selfishness in not wishing to share adaptation credits, so in case you get nominated for an Oscar, the credit would all go to you? DCT: Never mind. Next question. So do you intend to direct the next two books in the trilogy? DCT: Wait, Christopher Nolan doesn't have a beard. And George Lucas isn't that great. SHYAMALAN: Anyone who can conceive the Star Wars universe is great. DCT: Whatever. So, can we expect your usual cameo in the films? I don't remember seeing you in this picture. SHYAMALAN: I wanted to make it like a Where's Wally kind of cameo this time. It'd be difficult to spot me, as I am cleverly camouflaged with the whole Indian-looking Fire Nation army. DCT: Well, in the words of Chris Tucker, "Y'all look alike." Now let's talk about the title. Why did you settle for The Last Airbender, when all the fans of the original series know it as Avatar? SHYAMALAN: Well, we can all blame James Cameron for that. He's got more money than I do, so he can afford better lawyers, and eventually he won the court battle over the use of the name Avatar. DCT: Stupid Cameron. Maybe you should've banged his ex-wife Kathryn Bigelow for revenge. SHYAMALAN: Yeah, maybe. She's pretty hot. DCT: I know, right. Anyway, let's talk about casting. 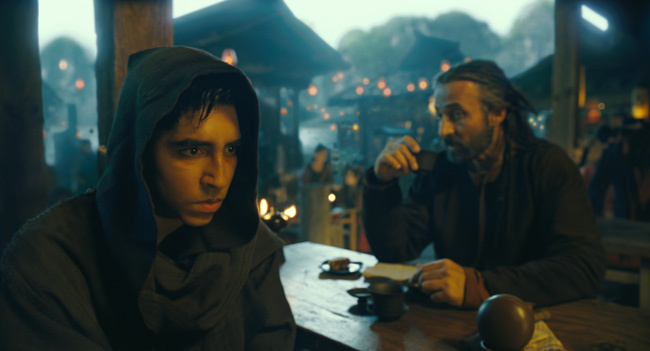 SHYAMALAN: Are we talking about the race thing again, about me not casting Asian actors? DCT: No, I don't really care about that. I was going to ask if it was true that you originally wanted Justin Bieber to play Aang, but he declined, so you went for Julian Lennon? SHYAMALAN: No, I originally wanted Jesse McCartney, not Julian Lennon. DCT: Oh, sorry. Those Beatle kids all sound the same to me. Anyway, let's go now to the last shot of the film. That smiling girl was Princess Azula, right? She's pretty. SHYAMALAN: Yes, her name is Summer Bishil. I often fantasize about her. DCT: Okay, too much information. Is it also true that during breaks, Dev Patel taught the whole cast to dance, and we'd all expect a "Jai Ho" number at the end of the third movie? SHYAMALAN: What? That's really absurd. I don't even like musicals. DCT: But you're Indian. Don't all of you like Bollywood? SHYAMALAN: I'm actually American. I grew up in New York. DCT: I thought you grew up in Philadelphia? SHYAMALAN: What? No. I grew up in the Bronx. DCT: Wait, I just googled it, and it says on your Wikipedia page that you grew up in Philadelphia. That's why your film The Sixth Sense was set in Philly. DCT: The "I see dead people" film. You're M. Night Shyamalan, right? SHYAMALAN: No, I'm not. I'm N. Might Shyamalan. That's N. Might. The Last Airbender. USA. 2010. Original rating: Four out of ten. Wanting to pat Shyamalan's head after the film and say, "Aw, it's all right, I loved you in The Village anyway": Plus one point. My love for the original TV series: Plus point five. My anticipation for the next two films in the franchise: Plus point six. My obvious bias: Minus point one. "My anticipation for the next two films in the franchise: Plus point six." They actually wanted to do six, like Star Wars, but Paramount and Nickelodeon told Shyamalan, "Why six? Make it three parts, like the TV series. That's one movie for every season of the series." Then Shyamalan said, "Okay, because I want to redeem myself and get to punch all the critics who didn't like my movies since The Village, I shall agree to everything you say, and kiss your asses in the process." Where's the LIKE button? This is your best pseudo-review yet. I actually did like the way he ripped off that first part from the animated series. Kind of sets the mood that you are in for something familiar. And then you get crap. Unfortunately, Blogspot has no "Like" button, but you can just send a link to your friends and tell them to read the review. Also tell them to click on the ads so I can claim some monetary benefit from Adsense. Thank you for thinking this is my best pseudo-review (yet), and I shall make my reviews this unconventional from now on. I actually dozed off in bunches(like 15 minute power naps) during this movie. I was even surprised and felt kinda' robbed when the end credits were starting to be shown. So basically, I have no right to comment on this movie. 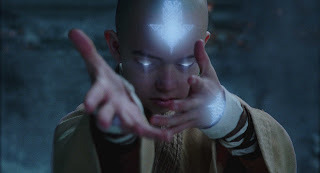 Though I liked the way Aang mischievously opened his eyes and looked around at his fellow monks while they were in deep meditation and his master monk(or whoever that was) kinda' waved his finger at him and he returned to closing his eyes. Kinda' reminds me of how mischievous I was when I was a kid. And I don't like seeing that many Indians all at once in one Hollywood film. Kinda' makes it look like Bollywood. @The Negation: The fact that you dozed off says a lot about the movie. Haha! Also, I heard from someone that having so many Indians in the cast is a sell out because they watch a lot of the Nickelodeon channel. Hehe. @The Negation: I also liked that scene where he opened his eyes. Hehe. @Sue Denim: Who told you that? Hehe. @Sting Lacson: I heard from an officemate. I think she read it from a forum of sorts. Hehe. And she liked the movie. Argh.